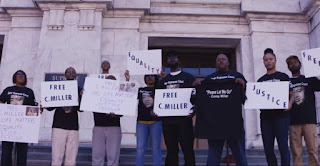 (The Wrap-Up Magazine) C-Murder, also known as Corey Miller, released a video “Dear Supreme Court/Under Pressure” last week. The Louisiana rapper serving life in prison for killing a 16-year-old boy is appealing to the state’s Supreme Court for help — through his music. The 45-year-old rapper proclaimed his innocence in the video and asked the state’s high court to release him, even though he has been convicted twice for the slaying. Prison officials are looking into whether the rapper recorded music while in the Angola prison. C-Murder told prison officials that any material released by his record company was recorded before he was jailed, but he refused to take a polygraph test. C-Murder was first found guilty in 2003 for shooting teen Steve Thomas during a brawl at a nightclub just outside of New Orleans. A state district judge later ruled prosecutors withheld information about the criminal background of a witness, and ordered a new trial. C-Murder was convicted again for the same crime in 2009.